Local and internationally-renowned artists will indulge Christchurch with a feast of work for six weeks only between 7 October – 18 November 2017. Popping up all around the city, the artworks are linked via the SCAPE Public Art Walkway and connected by the theme Time in Space (territories and flow). Managing Curator, Heather Galbraith has an exciting mix of artworks. Expect to be wowed by giant sculptures, intrigued by some complex themes, and even experience art in the sky! Auckland-based artist Gregor Kregar creates a site-responsive structure using handmade glass bricks, recycled wood and repurposed neon. This architectural folly offers a form of shelter, but is also open to the elements. It nods, to classic minimal sculptures of the 1960s and 1970s, but these materials also have a particular reading in Christchurch, given the vulnerability of brick and masonry buildings during the earthquakes. The materiality of this sculpture is highly evocative. The glass bricks shimmer and change colour as light passes over and through them, the simple circular structure is topped with a seemingly haphazard nest-like timber ‘roof’. At dusk the sculpture transforms into a beacon of light, and the work becomes a space for contemplation. The structure is built from repurposed and recycled industrial materials. 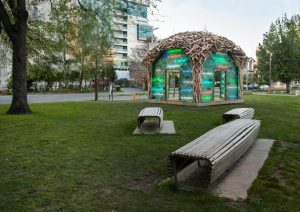 The work seeks to acknowledge ways in which the fabric of the destroyed city has found a new purpose, and to pay homage to the fortitude and resilience of Christchurch communities.